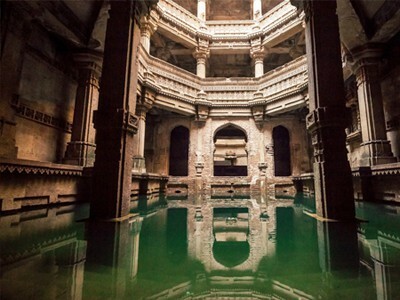 The Adalaj vav or Adalaj step well, lies in the peaceful village of Adalaj. Place is 29km north of Ahmedabad, is among the finest of the Gujarati step-wells. It was built by Queen Rudrabai, wife of the Vaghela chief, Veersinh in year 1499. The vav is one of the important tourist attraction in Gujarat. The vav is a spectacular example of Indian architecture and is five storey deep. It used to provide water to arid regions of Gujarat for household purposes. It has three entrances leading to a huge platform that rests on 16 pillars with corners marked by shrines. Well is octagonal in shape and is decorated with exquisite stone carvings. Sandstone is used for building the walls and each floor is supremely spacious and cool. The temperature inside the well is said to be about five degrees lower than the outside hot summer temperatures. Ahmedabad is easily reachable by air, train or by road. ← Victoria Memorial Hall – A veritable icon of the city of Kolkata!